How many of us have laughed at the wonderful GIFs (Graphics Interchange Format) of LSUFreek who poked fun at coaches, fans and teams in the south and east? We need a West Coast version, and thus the beginning of the FishDuck.com GIF Team to create the fun that our counterpart on the right coast has begun! We are building a team to create these GIFs in an ongoing basis and have a blast in the process. We have special thanks to give to Glenn Hanna who put in innumerable hours in production and did the lion’s share of the work, and to Ed Ouellette for getting the ball rolling. Of course, the “hack” (yours truly) contributed the story line . . . but the vision is easy, while the hours that Glenn put in were tough. Send this out to your Oregon friends, and don’t forget those in the Big-10 who resent Meyer, or those in the Big-12 who do not care for “Hook’em Horns Mack Brown,” or your SEC friends who might enjoy seeing Nick Saban in pigtails. Out west . 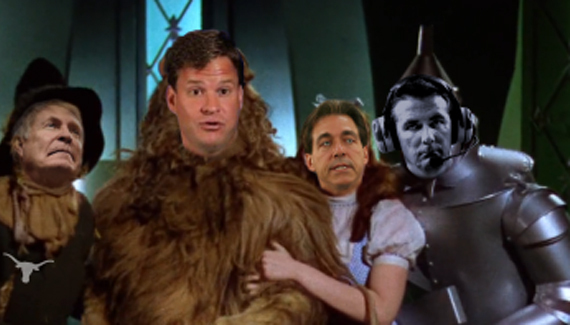 . . Kiffin gives us fodder every other week and we love to have fun with it!